The generation of solar and wind power don’t release any CO2 (the greenhouse gas to blame for global warming), and the amount of CO2 released by burning biogas is the same as that released during naturally occurring organic decomposition. Plus, there’s no limit to supply. As long as the sun keeps shining, the wind keeps blowing, and animals carry on… ahem…doing their thing, there will be a source of energy. The alternative to renewable energy is getting power from burning fossil fuels, which is how the world has been powered since the days of the Industrial Revolution. Both coal and oil are just that: fossils - the ancient remains of plants, algae and animals, which have been put under immense heat and pressure. These fossil fuels hold a huge amount of trapped carbon, which is released when they’re burned – and that increase in CO2 means a warmer planet and rising sea levels. 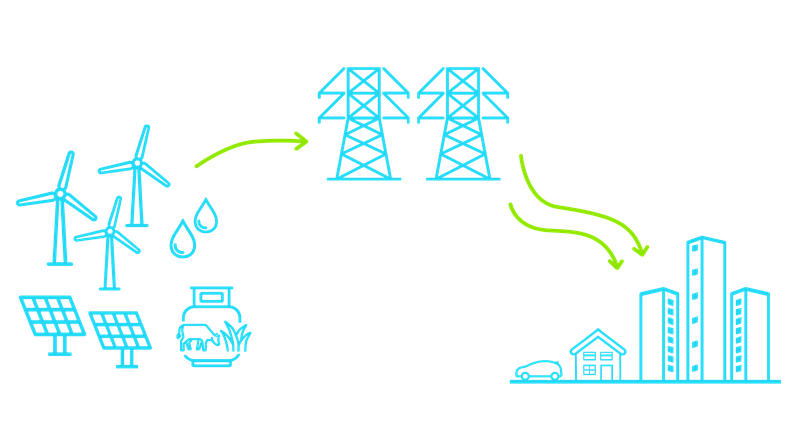 How does the renewable energy supply chain work? Renewable energy is generated, added to the national grid, mixed with energy from other sources, and finally piped out to houses and businesses in the UK. We guarantee that for every kWh of electricity you use, we’ll generate a renewable one to replace it. AND we also measure how much gas you use, and carbon-offset this through various environmental projects at home and abroad. Half way through 2018, we committed to providing even greener energy - switching all our customers to 100% renewable electricity, at no additional cost. This is heaps more than the 29% national average, and means that our carbon emissions are a big fat 0g/kWh, a vast improvement on last years' 132g/kWh and an even bigger improvement on the national average of 225g/kWh. The below breaks down our fuel mix compared to the most recently reported national average. We’re big fans of transparency here at Octopus, so you can even see where we get that renewable energy from around the UK. It’s a combination of Octopus-backed sites and third party suppliers, each of which help us make sure that our customers get as much green energy as possible. Octopus Energy is backed by the Octopus Investments. They’re the UK’s largest investor in solar generation, with over £2 billion invested so far. That investment alone generates enough power to supply a city the size of Manchester. As well as wind and organic waste generation, Octopus Investments invests in ‘smart technology’ to help build a new way of supplying and generating energy around the UK. One that will be based on a more transparent, push-and-pull network of tomorrow, helping to provide some much needed flexibility in the energy industry. And, why not learn how we've paired our Agile tariff with smart tech to allow customers to use up all those clean energy electrons without ever having to think about it. We're on a mission to bring low-carbon transport to the UK - if you think you could switch to a car that doesn't pollute the earth (or your lungs), it might be time to give our friends at Octopus Electric Vehicles a call. 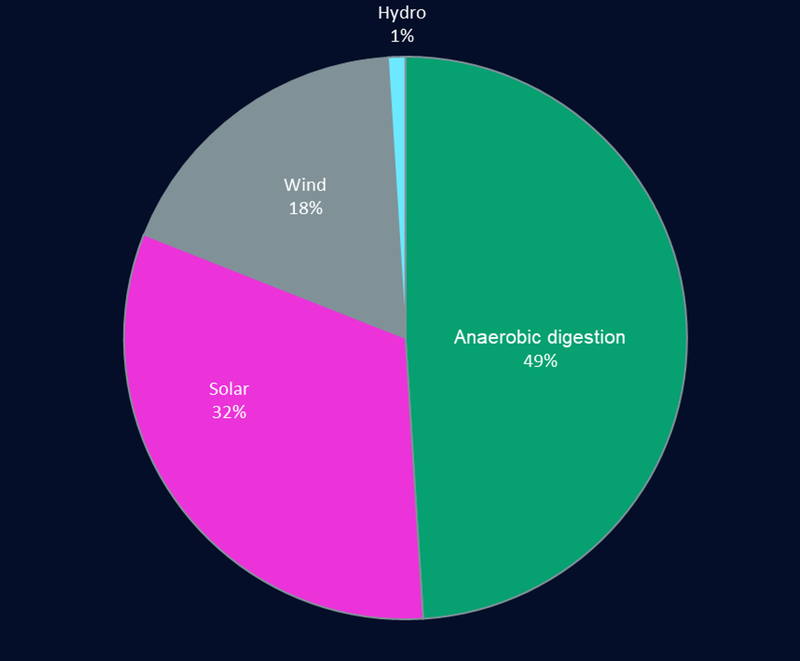 Read about anaerobic digestion - the amazing process of repurposing organic waste from farms, or even your kitchen bin, to produce clean, low-emissions fuel and prevent methane from entering the atmosphere. Plus, get our favourite office vegan's take on how "animal friendly" it is to turn animal slurry into green energy. Find out how we joined forces with pop stars, MPs, and Blue Peter gardeners to plant nearly 2,000 trees in schools and community spaces across the UK in support of the United Nations Environment Programme's BreatheLife campaign. Read about how we've paired up with Renewable World to make sure our very greenest customers have even less of a carbon footprint by offsetting the carbon emissions of their natural gas usage through renewable energy projects around the world. And there's plenty more. Just head to our blog to read about everything from solar storage to tree planting to our green partnership with Arsenal FC.